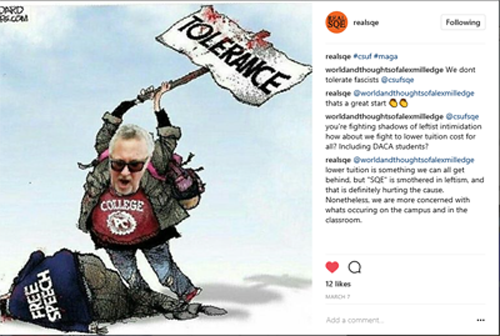 Cal State Fullerton Students for Quality Education (SQE) are calling for a “hate Speech” investigation into an Instagram parody allegedly mocking SQE, “Latinx” students, and Cinco de Mayo, according to a report in the Daily Titan. In a bold move, College Republicans President Chris Boyle acknowledged his members are behind the parody account @RealSQE but offered no apologies. SQE faculty advisor and Senate member Jon Bruschke, Ph.D. was not amused and quickly drafted and furnished an “emergency resolution” denouncing the “hate speech” to the Academic Senate and is calling for an investigation. Boyle isn’t having any of it and told the Daily Titan this is “typical behavior” of SQE to accuse the College Republicans of being racists. The fake SQE account had previously been brought to Bruschke’s attention. At that time he contacted College Republicans club advisor, Janet Eyring, Ph.D., who informed him the club was not sponsoring the account, but individual club members may be doing it on their own. “I did not see or know about any advertisement for a fake Cinco de Mayo event at Baja Fresh and, of course, would not endorse any club member engaging in that type of activity,” Eyring wrote in an email to the Daily Titan. SQE member Liz Sanchez alleged Young Americans for Liberty (YAL) President Aaron Van Meter Jones, along with others who hold positions on the CSUF College Republicans club executive board, are the main administrators for the fake account.